A few days before heading off this time for Spain, a good friend, instead of telling me to have a good time, encouraged me to be open to the possibility of ‘letting Spain sink in’. I am travelling here for the tenth time, I have spent many months all told here, I have met many interesting people and, of course, seen fascinating sites and in many ways tasted some of what Spanish life and culture is all about. But I know that I will never be able to leave behind who I am in Canada, I will never to able to fully understand what it is to be Spanish, I do not even pretend that I would be able ever to do this. But I do get hints, I feel traces, even intimations, I have come to understand something of Spain by reading their histories, their literature, their daily press, and, of course, by standing in reverence and, at times, awe before their art and architecture which are capable of yielding insights into the mystery of what it is to be Spanish. That’s enough of that. Now to today and some moments of letting Spain ‘sink in’. I am back in Covarrubias, the tiny ancient village which played a significant role in the 11th century in the resettling of this central band of Spain, the Duero River valley and the lands north of it, for centuries a kind of no-man’s land, the frontier between the north Christian kingdoms and the southern Moorish ones. I feel at home here, just travelling the final 15 familiar kilometres warms me, knowing what I will see over the next hill, around the next bend, enjoying the rich colours of spring, the brilliant greens of the young spring wheat, interspersed with fields of red soil, and today, everywhere, the apple and cherry trees in bloom. 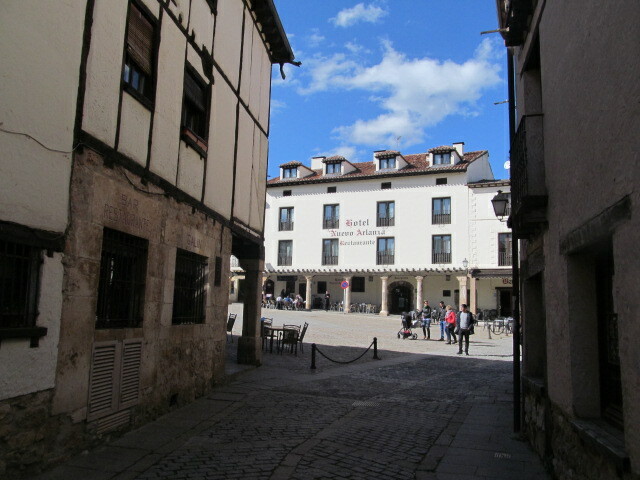 And of course, my regular pension, family-run hotel, bar and restaurant, Casa Galin, and my dueño, Ezechiel, waiting for me. I figure that it’s my ninth time here and this is the place I brought my brother and sister-in-law a few years ago to introduce them to Spain. 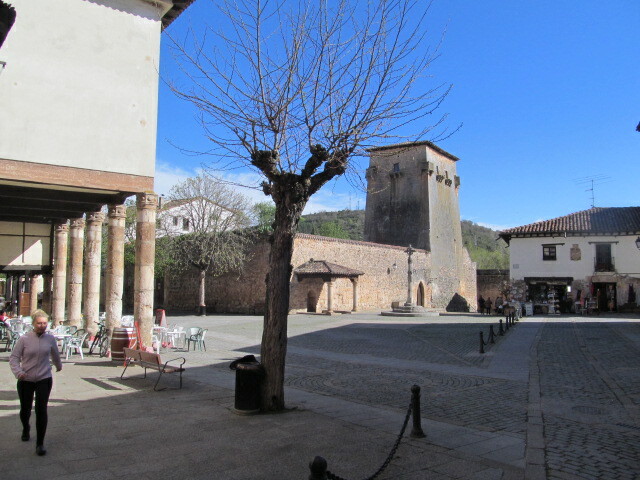 From my window, I see this square with its 12th century tower; you see the side of Casa Galin from the second photo looking into the Plaza Mayor of the village. 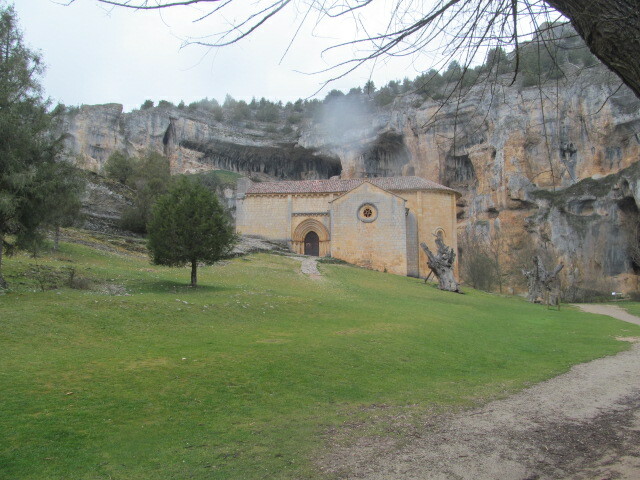 I spent the afternoon at the Visigothic ermita which I wrote about in post #23. Antonio, my guide, is bored with his job. I think that he would rather run than talk to the tourists who arrive, most of whom are Spanish; they are a people who are deeply interested in their history, in their patrimony. They travel extensively in their own country. Today I assumed my temporary role as guide and I had a ball. I shared my knowledge of this building with two couples at one point and then with a single visitor. 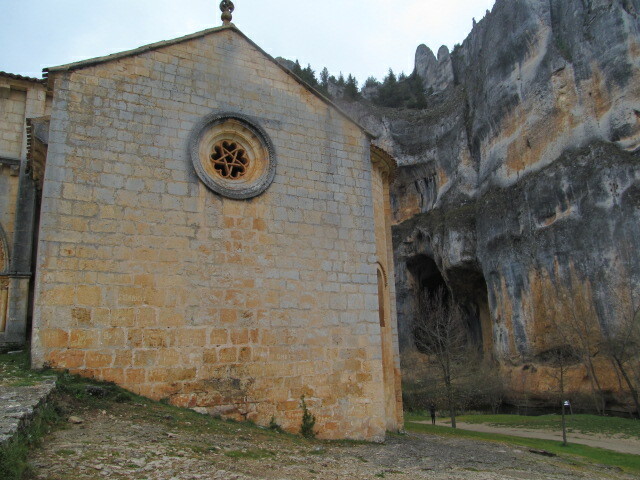 I have studied, I have read the academic texts, I have even written a paper for my medieval professor at York on this building, I have seen most of the handful of other Visigothic sites in Spain and am able to talk about this one in relationship to the others, etc. I get very excited talking about it and sharing what I have learned and in particular about a theory I have regarding it. Sharing my passion with those who share the same passion – for me it worked today – and, as a result, Spain was sinking in. At times, I feel a genuine buzz in the presence of these ancient, beautifully cut and put together stones. I want to return to spend time in them. The buzz also happens when I visit one of these sites for the first time. Cathedrals do nothing for me; the small isolated village churches draw me strongly. If I look carefully,they are ready to tell me about what it was like to live in these communities 800 years ago (1300 years ago for this ermita visigoda– the sharing of their joys, sorrows, and genuine fears, including violence from the powerful classes, disease, famine and whatever they believed the dark powers to be. The medieval festival must have been a wonderful experience, a day or so to enjoy, to put out of one’s mind all these fears and survival concerns, to laugh, dance, carouse and eat heartily with your neighbours before returning to the daily drudge. And these little buildings were at the centre of all this community life. In the post #23 is the gist of what I was sharing with my Spanish ‘tourists’. 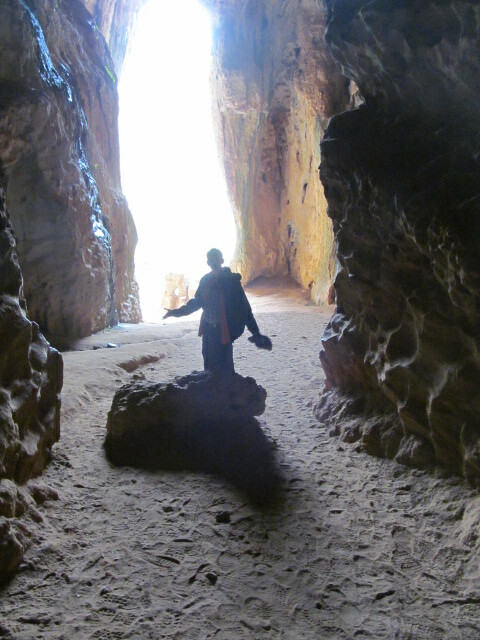 So let me share some photos of an another ermita, that I finally got to visit on my way back to Covarrubias – the ermita of San Bartolomé hidden away in a spectacular canyon, El Cañon del Rio Lobo. Look again, I do not have to translate. It’s the 12th century, it has been built in an isolated area like so many small monasteries, far from greed, violence and sins of the flesh. The medieval mind considered it well nigh impossible to gain salvation if you lived out there in the world. Retreat was the only way. Now if you read my last post carefully, you will know that the artisans who created this window were mudéjar, Muslims who were continuing to live in this area after the Christians had taken control. 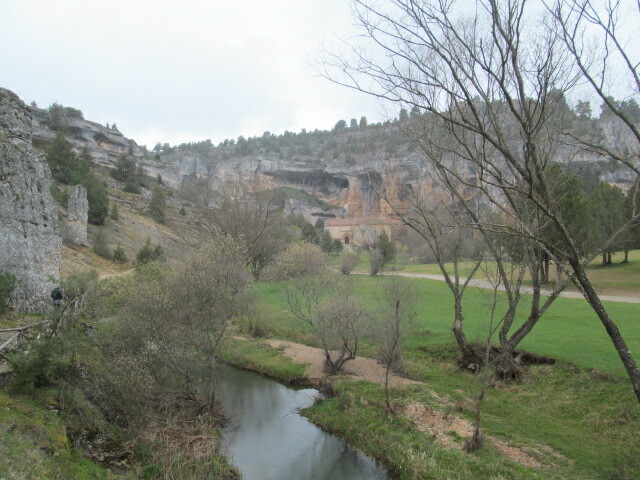 In the background is the very large mouth of a cave in which prehistoric drawings have been found. 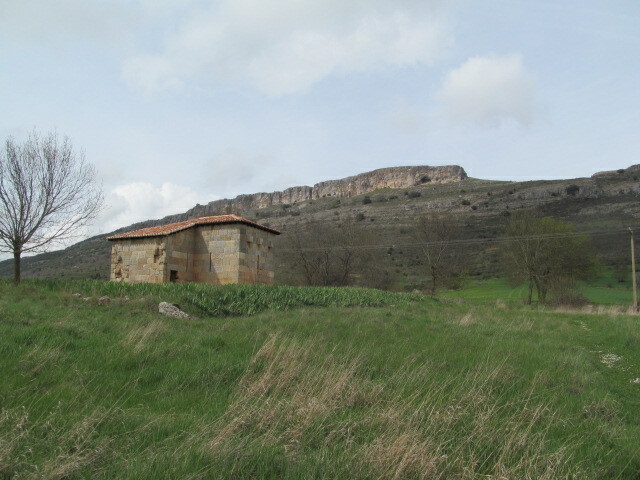 Chances are that earlier generations of monks had used it as their refuge, a common habit across the mountainous north. Fun up under the eaves! That bold little kid again! 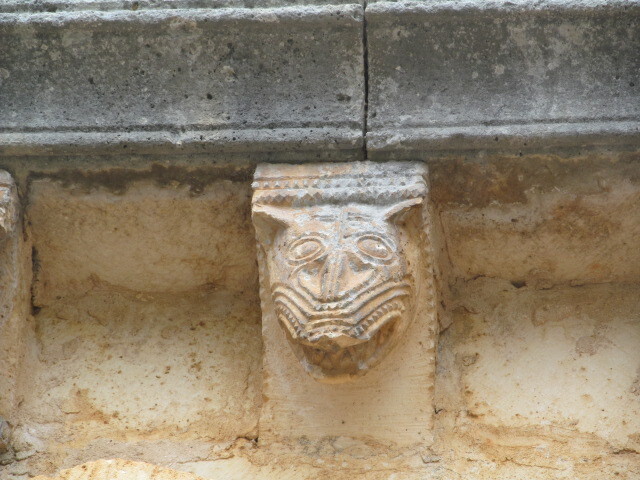 More than likely this is a carnaval mask of a wolf rather than an image of the wolf itself. 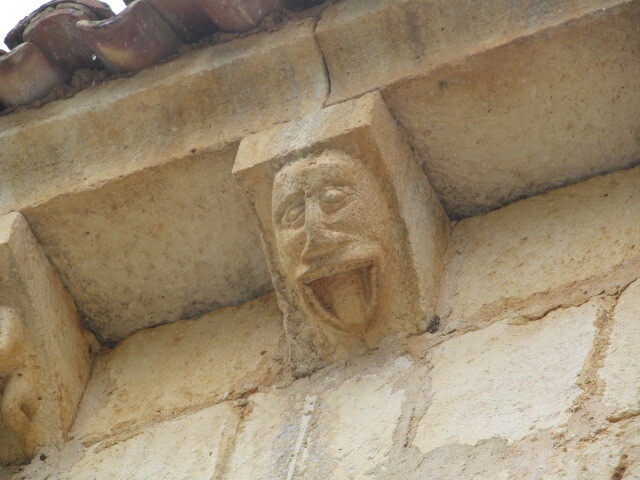 Such sculptures appear under the eaves of countless small churches. Now I have learned from my time in class up at York Univeristy with Professor Malcolm Thurlby (whose classes I ‘thoroughby’ enjoyed) that the art historian relishes finding unique pieces for the first time. 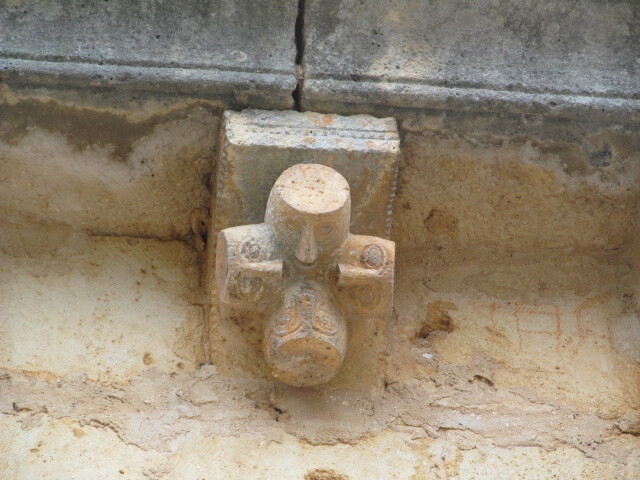 I have never seen a cornice with the four heads looking in on each other. The flat heads are also wonderfully unique to me. When visiting here, I met a couple from Belgium. We chatted a lot in my totally mixed up Spanish/French. 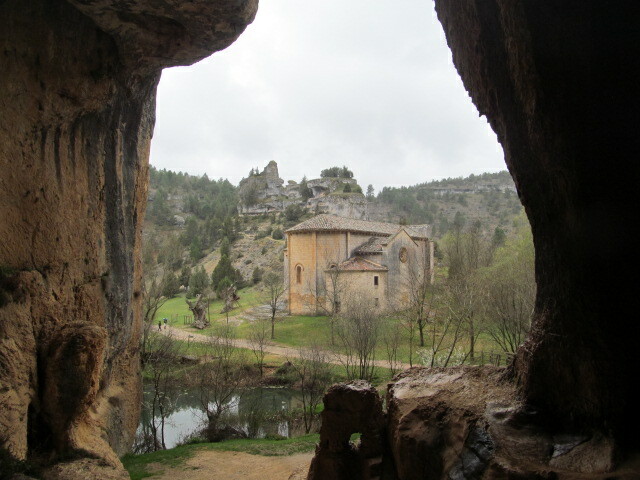 She is similarly obsessed with Romanesque small churches and they have travelled quite often through France and Spain. It was fun sharing this discovery with them. Ah yes, the life of a typical medieval community involved wine and I am not sure what, on the right. 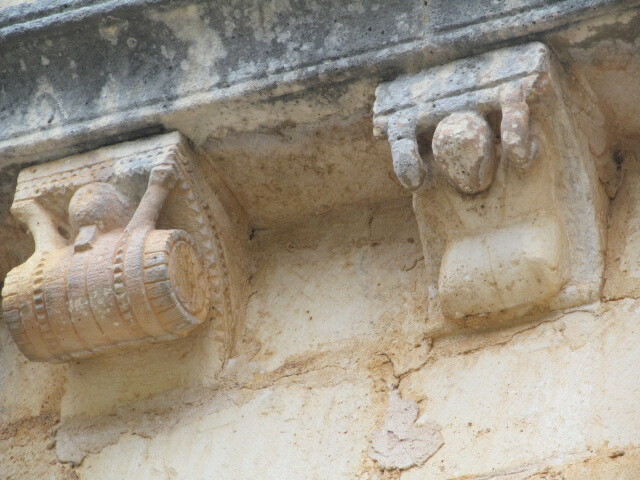 The position of the arms reminds me of frequently seeing acrobats under the eaves? Carnaval fun! And does the wine drinker not appear to be chugging directly from the barrel, or is that a firkin? A dramatic setting! One of the Belgians photographed me. Could the light be construed as an enormous halo? Give it a rest, Ed! I went back to check out a few more of the cornices. Dancers? Flautist? Post #19 might answer your puzzlement of what else might be happening with one on the right? And a final shot to try to give you some sense of the towering canyon. There are hiking trails for miles up the river with the walls rising on both sides. 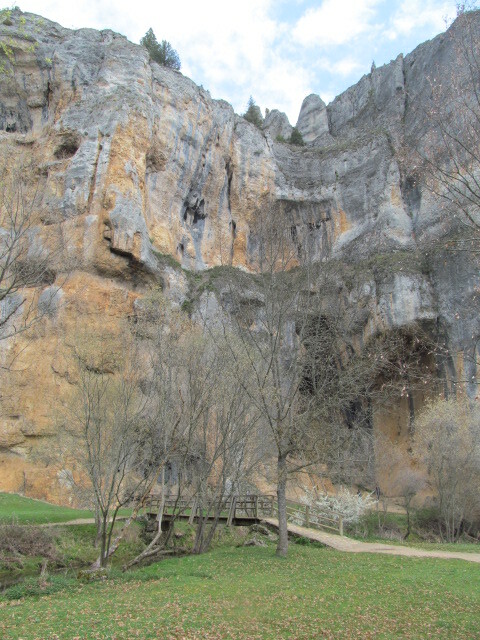 Spain is rich in canyons, that all I can say. This entry was posted in Uncategorized on April 19, 2015 by agnotarte. Thanks Ed for the tour of one of your all time favourite buildings. I’m so glad Antonio let you play tour guide. You look beatific in the surreal light behind you.